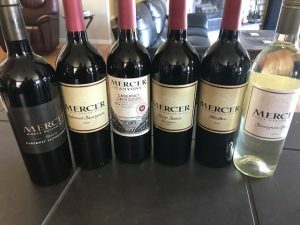 Mercer Estates - Write for Wine: It's Wine O'Clock Somewhere!Write for Wine: It's Wine O'Clock Somewhere! This Malbec (78%) is blended with Cabernet Sauvignon (22%) — the result is an inky-colored, concentrated, balanced and complex wine with aromas of blackberry, followed by flavors of more blackberry, baking spices, coffee and vanilla. Pair this wine with beef, lamb, spicy foods or hard cheeses. Cabernet Sauvignon and Syrah make up the majority of this blend, which is Mercer Estates’ best-seller and go-to wine — specifically, Cab Sauv (29%), Syrah (27%), Merlot (18%), Petit Verdot (14%), Grenache (10%) and Carignane (2%). The nose of blackberry jam and plums opens up into flavors of dark cherries and ripe berries. This is a fun, fruit-forward wine, named after the Mercer’s grandmother, Carma Sharp-Mercer, and her five Sharp sisters. It’s perfect to take to parties, an autumn picnic or have as a night-cap. Or you can pair this wine with smoked meats, grilled meats, brisket, pasta with red sauce or pizza. This is a softer 100% Sauvignon Blanc than many available today. It features a pretty nose, with hints of grapefruit, hay, grass and tropical fruits. More light grapefruit is on the palate, along with notes of gooseberry and tropical fruits. This is a clean and refreshing Sauv Blanc, a nice, crisp summer sipper to enjoy on the deck, by the lake, by the pool or on a picnic. But as we drift into autumn, you could also sip on it before dinner, or pair it with fish, shellfish, bright salads or soft cheeses. What a beauty! This wine is complex, well-balanced, and powerful, yet graceful and elegant. The Cab Sauv (84%) is blended with Malbec (16%) and has the potential to be even more stunning than the 2009 vintage that we wrote about back in 2013. Aromatics of dark fruit, caramel, espresso, cocoa and baking spices turn into flavors of dark cherry, pomegranate, black plum and more caramel. While it is drinkable now with decanting, we recommend laying it down for at least another year or two to truly appreciate its lusciousness. Pair this wine with a thick steak, grilled flank steak or any beef dishes, and add a spicy arugula salad. Or sip it with dark chocolate in front of the fireplace. This Cabernet Sauvignon is complex, elegant and big, yet with a decent price point. The Cabernet Sauvignon (75%) is blended with Syrah and Merlot (12% each) and topped off with Petit Verdot (1%). This wine is classic Horse Heaven Hills Cab Sauv, with aromas and flavors of blackberry jam, plums, cassis, vanilla, toast, mocha, caramel and cherries. If you’re still barbecuing, this wine will pair perfectly with juicy steaks or burgers. Or you could pair it with grilled meats, lamb chops, prime rib or pork shoulder steak. In May, Mercer Canyons 2014 Cabernet Sauvignon topped the 2017 Indy International Wine Competition as best of show — just one of several recent accolades for Mercer Estates. The Cab Sauv (77%) is blended with Merlot (15%), Petit Verdot (6%) and Syrah (2%). A great expression of Horse Heaven Hills terroir, the Cab leads with aromas of dark fruit with a hint of licorice, earth and herb, followed by notes of more fruit, vanilla and baking spices. Talk about a great-value red! Pair it with juicy burgers or pizza or any grilled meats. Or drink it with friends, take it to a party, or to a casual restaurant that allows corkage (but check first for the fee). Whether you’re planning a visit to Seattle or Central Washington’s wine country, be sure to put Mercer Estates on your list of must-visit tasting rooms. This entry was posted in Bordeaux Blend, Cabernet Sauvignon, Grenache, Horse Heaven Hills, Malbec, Merlot, Petit Verdot, Sauvignon Blanc, Syrah, Washington, Wine and tagged Cabernet Sauvignon, estate wine, Horse Heaven Hills, Malbec, Mercer Canyon, Mercer Estates, Mercer wine, Merlot, Petit Verdot, Sauv Blanc, Sauvignon Blanc, Syrah, Washington wine, Washington wineries, wine, wineries by Margot. Bookmark the permalink.